Re-introducing conscription would mean fewer bellicose politicians, argues Will Self. Last week, on the anniversary of the extra-judicial killing of Osama Bin Laden that he authorised, Barack Obama, the president of the United States and commander-in-chief of its armed forces, strode on to a catwalk erected in a hangar at Bagram Airbase in Afghanistan under the probably somewhat weary eyes of the assembled military personnel. Weary, not least because it was 04:00 local time - although it was prime viewing time back home in God's own country. After clasping the hand of the general who introduced him, and administering a very manly hug, the president went on to announce that complete victory over al-Qaeda was in sight, while linking this to the draw-down of US forces in the region, the clear implication being: We won. I'm not particularly interested in unpicking all the illusory veils that this mediatised event were shrouded in - I don't suppose this studio could contain all the fluff that would be generated - suffice it to note that the wide-awake Taliban delivered their own very real riposte within hours of Obama's departure, in the form of a suicide bombing that killed several Afghan civilians. No, what struck me observing the footage from Bagram was the same thing that had a year before, when we saw images of Obama, together with Hillary Rodham Clinton and assorted advisers, civilian and military, watching the film taken by US Navy Seals of Bin Laden's assassination. In those shots, Obama looked the very soul of martial informality: wearing a dark windcheater jacket and buttoned-up white shirt, he sat modestly in the corner, his expression intent and resolute. There was no hint of bloodthirsty triumphalism, but nor did he appear overawed by the moral implications of what he - a committed Christian - had sanctioned. At Bagram, perhaps not wishing to appear as a different kind of poseur, Obama eschewed any uniform, save suit trousers, white shirt and clerically dark tie. True, his sleeves were rolled up, but this, surely, was only an unconscious signal that he was the man to get the job done - so long as he's re-elected. What is it about power that almost invariably makes even its democratically-elected wielders come over all macho? Recall: Barack Obama was a gawky kid from Hawaii who cut his political teeth as a community organiser on the poor south side of Chicago. Up until he became the president, his demeanour was in keeping with the academic career he'd pursued for over a decade. Or take our own elected leaders - from Margaret Thatcher on, a key aspect of the premiership seems to have become posing with tough, tough boys and their tough, tough toys. Thatcher - in the turret of a tank, her hat swathed in what appeared to be white muslin - was the iconic image of the Iron Lady. But Blair hugged the army hoodies with just as much enthusiasm - 'coptering into Kosovo, Bagdad and all points east, lean and fit in his trademark black jeans, ready to sprinkle a little stardust on the dull and fearful slog of war, and have a lot of the military's own unimpeachable patriotism, self-sacrifice and sheer bloody grit rub off on him in turn. And so it goes on, with Cameron swapping his bicycle and wind turbine for a flak jacket and a Hercules transporter - it's an act that looks a little unconvincing, though, in all their cases. The years of National Service in Britain span almost two decades - from World War II to the birth of the Beatles. 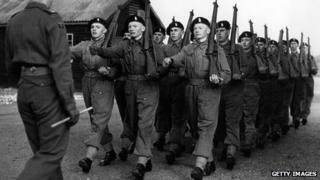 Between 1945 and 1963, 2.5 million young men were compelled to do their time in National Service - with 6,000 being called up every fortnight. The former industrial chemist, the one-time lawyer, the party wonk, and - if by some caprice of Jove, Ed Miliband becomes premier - another party wonk, what do these people know, really, of the profession of violence, which is what, in the last analysis, soldiering consists of? The contrast with the past is instructive, as ever. After the debacle of the Gallipoli landings, their chief architect, Winston Churchill was demoted within the cabinet, then resigned and had himself commissioned as an officer and sent to the trenches. There he fought with distinction for several months, making numerous sorties into No Man's Land. This made it difficult - once World War II was underway - for the conscripted army to feel that their prime minister didn't understand their situation perfectly well. Now, of course, we have professional armed services and professional political classes. The distinction between them seems to be this: politicians have done nothing but politicking before they assume office, soldiers are often unable to do anything once they've left the service. Otherwise the two castes complement one another well, and by carving up the realm of conflict into mutually self-supporting zones of "expertise" make it difficult for the largely unsuccessful foreign interventions of the past fifteen years to be successfully opposed. It matters whether or not a majority of the population may oppose any given adventure. The professionalisation of waging war puts it as far beyond our ken as the activities of other professionals - tax accountants, say, or oncologists. I suspect that besides the obvious thrill of being a bellicose poseur, what drives our political leaders into the arms of the military is anxiety. Suppose you've spent the entirety of your working life pushing paper in an office and concocting ways of winning elections - then the heavy wooden door of Number 10 finally swings closed behind you and you're treated to a series of hushed briefings from serious men and women who array before your blinking eyes scenarios of deathly force directed against your electorate and yourself. Meanwhile, out in the back garden, a couple of strapping fellows are parading up and down the lawn with Heckler & Koch machine guns around their necks, their mission: to stop the baddies scything you down. Under such circumstances, even the most competent Oxford PPE graduate is likely to feel a little nervous and think to themselves: best do what these people tell me, they seem to have their heads screwed on. Then, as the days and months of being hustled from car to plane to secured room pass, the captive prime minister begins to suffer from Stockholm Syndrome, to fall in love with his armed captors (sorry, I mean protection officers), and even suffer from the delusion that he, too, is capable of terminating his enemies with extreme prejudice. In my view this state of affairs helps nobody - not the politicians, with their adrenalised dreams of foreign adventuring to offset domestic torpor, nor the armed services who feel themselves, rightly, to be used - and certainly not the citizenry, who remain effectively powerless, our military role diminished to waving Union flags and sporting paper buttonholes. So, here's a modest proposal that I think will satisfy everyone the length of the political spectrum: since we require defence against potential aggressors, let us all, collectively, be responsible for it. Yes, that's right: Bring back National Service! The cry beloved of the ramrod-straight and the crew-cut is joined by me with all my bohemian heart. Old, young, female, male, straight, gay, industrial chemists, lawyers and even party wonks - let us all do our bit and maintain a citizen army, as the Swiss do, numbering in the many millions. Personally, as someone who enjoys nothing more than a little camping, marching, and target practice, I'd be first in line. However, we don't want a tooled-up nation that suffers from a constant sense of embattlement - like, oh, I don't know, Israel for example - so, while accruing all the marvellous open-air and discipline-promoting benefits of annual service in the armed forces, we should also take serious steps towards reducing our exposure to foreign threats. I can think of quite a few nations that, while wealthy and covetable are never viewed as seriously at risk of invasion - Sweden springs to mind. A neutral Britain with a citizen army would become a powerful moral counterweight to the expansionist and meddling powers that flank us to the west and the east. But what, I hear you chorus, about those situations in which we have an incontrovertible duty to intervene even if they don't present us with an existential threat? To which argument I can only reply - do you seriously think we would have that much difficulty in mobilising an expeditionary force given a pool of 20 million odd - some, no doubt, very odd - trained personnel? No, the continued existence of a professional army remains now what it has always been - an expression of the authority of the state over the individual, and of those individuals that control the state over the rest of us. If Barack Obama had called upon a citizen army to get up in the middle of the night so as to bolster his re-election campaign, he would've been greeted by a deafening chorus of snores.